For users of the Geomechanics Module, COMSOL Multiphysics® version 5.3 brings extensions to the Mohr-Coulomb and Drucker-Prager soil plasticity models and to the Tresca yield function in plasticity analyses. Read more about these updates here. The Mohr-Coulomb and Drucker-Prager models for soil plasticity have been extended with a nonlinear hardening model for the elliptic cap of the yield surface. An associated flow rule has been added to the Tresca yield function in plasticity analyses. 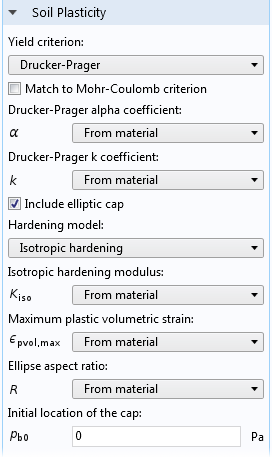 As before, the default flow rule uses the von Mises yield surface as plastic potential, but this can be changed in the Settings window.